Hiring remote workers can seem like a risky endeavor. A wider range of talent is at your disposal, true, but you must also deal with how to keep staff on task, working efficiently, and communicating clearly. Managing remote teams requires both a different mindset and a different toolset than a physical office. Luckily, the cloud is helping to break down the barriers that come between remote workers and the rest of their teams. In the past, remote teams were managed via multiple long email chains, and keeping track of everyone and their productivity could be a nightmare. Now things have evolved, and all the tools you need to run an orderly virtual office are at your fingertips. Regular communication is key to an efficient workplace. Several cloud-based apps are available to give remote workers a real office feel. On top of that, everyone’s chats are archived in the cloud in case something needs to be looked up later. These apps essentially work like chat rooms with built-in features just for businesses. Workers log in and greet colleagues when they begin work, keep the whole team updated on what they’re up to, and sign off when they’re done. Most services include mobile apps so workers can stay in touch while on the go. Some offer native desktop apps while others are web-based. The most popular app for this purpose is probably Slack. The basic version is free, keeps an archive of the last 10,000 messages, and includes 10 “service integrations”, which are essentially third-party apps that have built-in support for Slack. Slack is best for teams of people who need to communicate regularly but not constantly. Flowdock, Yammer, and Convo are other solid solutions, but their free tiers don’t offer as much. These are preferable for teams that need to talk a lot throughout the day and send a high volume of messages, such as virtual newsrooms. Convo and Flowdock both feature color-coded threaded conversations, which helps keep track of specific topics so they don’t get lost in the flood of messages. If you need video chat integration, try HipChat or Cisco Spark. Paid products are usually priced on a per-user, per-month model. Cloud-based project management tools let you delegate tasks to employees and monitor progress. 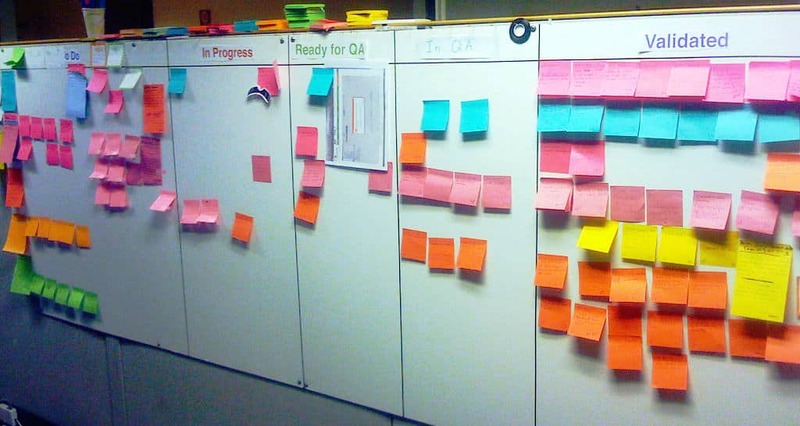 The main interface of these apps is usually a scrum board, which lists each project and associated tasks on notecards or post-it notes (digital ones, in this case). In the simplest terms, as a task progresses from planning to completion, its card moves to the right. The project manager can assign tasks, create teams, and set deadlines. A wealth of options are available depending on your preferred development method, but some big names include Trello, Jira, Basecamp, ProjectManger.com and Asana. Many of these programs, including Asana and Jira, include communication channels similar to those mentioned above. Sometimes these come in the form of a chatroom while other times they are more like a Facebook wall with statuses and comments. Like enterprise communication apps, cloud-based product management tools usually include a free tier. After you exceed a certain number of team members or projects, pricing happens on a per-user, per-month basis. The capability of collaborating on code, documents, presentations, and whatever else your working on will be essential to a remote workforce. Collaboration tools vary widely depending on what your working on, but the main idea is that everyone assigned to a task can instantly see the work their colleagues have done and contribute in a single place. This prevents any overlap and encourages teammates to work together. For many purposes, free collaboration tools are more than enough to get the job done. Google Docs works fine for editing most text documents and spreadsheets. If you want something with more robust features and greater control over user permissions, Hackpad offers both free and paid tiers. Evernote also allows for collaboration on its interface, which is useful for discussing notes, audio clips, and even presentations. Github is sufficient as a fast and easy code repository and version control system. Mind-mapping is another useful method for brainstorming ideas that can now also be performed on the cloud. There are at least a dozen solid choices, but XMind and MindMeister are a couple major players. First off, remember that cloud storage and cloud backup are not the same thing. Storage is simply a place to put files, but those files aren’t necessarily the same as what’s on your hard drive. Storage is used to put files on the cloud that everyone on your team – or specific people on your team, if you prefer – has access to. Google Drive and Dropbox will often suffice, but aren’t always the most secure. If security is a concern, you can either encrypt items before uploading with programs like BoxCryptor and Viivo, or find another solution. SpiderOak and TeamDrive are just two of many encrypted cloud storage solutions available. Keep an eye out for storage services that offer synchronization, which keeps the most up-to-date version of a file or files on all devices. If you need to back up the workstations of each team member, look into getting a subscription for an enterprise online backup solution. This will allow you to store the contents of multiple computers on a single account and ensure each employee’s backups are up to date via a single dashboard. Cloud backup is best for businesses that own their workers’ computers, but is usually not necessary (and in some cases, not legal) for employees who work from their personal computers. IBackup is the best enterprise solution we’ve tested yet. It comes with top-notch security, sub-accounts for easy management of multiple devices, fast upload speeds, and useful add-ons like local and server backups. Read our full review of IBackup. Before you set off making accounts on all your new virtual office tools, keep in mind security. Don’t use the same password for all your admin accounts, lest all of them get hacked at the same time. To help you keep track of all those passwords, instead of memorizing them, get a password manager. LastPass, KeyPass, and 1Password are all secure apps that allow you to store all your complex passwords for each account. When you want to log in, you need only remember the single master password. They work across multiple devices and the enterprise-level solutions allow the main admin to choose which employees can login to which services, all under a single portal. LastPass offers an enterprise tier specifically for businesses, but KeyPass and 1Password have multiple-account solutions available as well. Read more about creating and securing strong passwords. In your journey to building the ideal online team with the latest and greatest tools for the job, it’s easy to go overboard. In reality, it’s best to keep the number of tools and services down to a minimum. Using Trello and Basecamp side-by-side, for instance, probably isn’t necessary and can be consolidated into one or the other. Your team will thank you for streamlining operations to as few tools as necessary, thereby reducing workload. Only use what your team really needs and only change if necessary, as employees will tire quickly of incorporating new tasks into their daily routines. Know of more cloud apps and tips for remote teams? Let us know in the comments! The most important thing to have in mind with remote workers is that you need to trust them, without that, it doesn’t matter what apps you use, they will try to cheat you and waste your resources. also, people don’t have to feel like they’re being spied on. I use an app called Paymo that combines time tracking with project management and invoicing. It has a file storage option, discussions, email integrations, basically everything you need to help you get everything under one roof. They also have a nice automatic time tracking app called Paymo Plus.